Dr. Eugenie Brunner has received the “Compassionate Doctor,” “Best of South Jersey,” “Exceptional Women of Medicine,” and “America’s Most Honored” distinctions, totaling over 24 awards in her career. Princeton, NJ — Dr. Eugenie Brunner is familiar with winning awards. 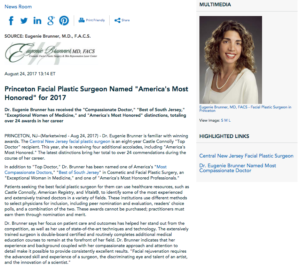 The Central New Jersey facial plastic surgeon is an eight-year Castle Connolly “Top Doctor” recipient. This year, she is receiving four additional accolades, including “America’s Most Honored.” The latest distinctions bring her total to over 24 commendations during the course of her career. Patients seeking the best facial plastic surgeon for them can use healthcare resources, such as Castle Connolly, American Registry, and Vitals®, to identify some of the most experienced and extensively trained doctors in a variety of fields. These institutions use different methods to select physicians for inclusion, including peer nomination and evaluation, readers’ choice polls, and a combination of the two. These awards cannot be purchased; practitioners must earn them through nomination and merit. Dr. Eugenie Brunner is double-board certified in Facial Plastic and Reconstructive Surgery and Otolaryngology. In addition to winning Castle Connolly’s “Top Doctor” award eight times in a row, she is an active member of several prestigious medical organizations, including the American Academy of Facial Plastic and Reconstructive Surgery, the American Academy of Otolaryngology Head & Neck Surgery, the American Academy of Cosmetic Surgery, and the American Society for Laser Medicine & Surgery. Dr. Brunner is also a Fellow of the American College of Surgeons and the American Academy of Facial Plastic and Reconstructive Surgery, and a graduate of Rutgers College, the Robert Wood Johnson Medical School – University of Medicine and Dentistry, and New York University Department of Head & Neck Surgery. She is available for interview upon request.